The Super Bowl's thirty-four-minute blackout was a moment that says so much about the USA in the twenty-first century. Super Bowl XLVII will be remembered for the Baltimore Ravens’ thrilling 34-31 victory over the San Francisco 49ers. It will be remembered for Ravens quarterback Joe Flacco’s MVP performance. It will be remembered for San Francisco’s remarkable comeback from a 28-6 deficit led by their quicksilver quarterback Colin Kaepernick in just his tenth career start. But more than anything else, the game will be remembered for a thirty-four-minute stadium blackout early in the second half that plunged the New Orleans Super Dome first into darkness and then a kind of eerie twilight. The official reason for this calamity was that too much electricity was coursing through the dome after Beyonce’s fierce halftime show. Unofficially, this was a symbolic moment that could resonate far longer than the game itself. Some will see the blackout as a comment upon New Orleans. 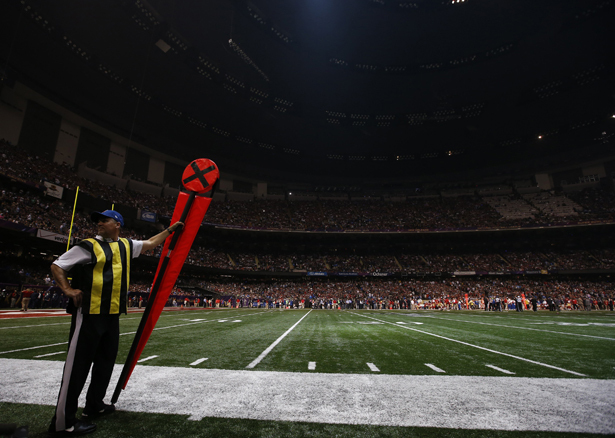 The Super Dome is supposed to stand, in post-hurricane, post-levees New Orleans as a symbol of the city’s resurgence. It’s also supposed to stand as a symbol of the city’s reborn tourism industry and status as an “event town” ready to be the Mecca for Fortune 500 companies and the hottest happenings in sports. But this economic comeback, with an emphasis on low-paying, zero-benefits service-industry jobs, has had another effect as well: widening inequality. The poverty rate is up to 29 percent, 8 percent higher than in 2007 when the city was still rebuilding after the Hurricane. Child poverty is up to 42 percent and the Lower Ninth Ward has seen its population drop by 80 percent in the last decade. The “event economics” of what Professor Jules Boykoff calls “celebration capitalism” only exacerbates these trends, creating a small army of migrant service-industry workers forever attempting to catch on to the “seasonal work” brought by these splashy yet temporary gatherings. Nineteen sixty-eight Olympian Dr. John Carlos once said, “The reason the Olympics are only every four years is because it takes them four years to count all the money. The problem is who gets a piece of the pie and who gets the crumbs.” This completely correlates with an event like the Super Bowl. It’s a neoliberal Trojan Horse that brings a tremendous amount of capital that flows up and barely trickles down. As for infrastructure, city officials trumpet the millions an event like the Super Bowl will bring into the city, while not saying a word about the billions in corporate welfare that goes into making the gathering “suitable” for the thousands of outside guests. Roads, bridges and public transportation, actually see a net loss. This isn’t a New Orleans story. It’s the story of Urban America whose levees broke long before the 2008 recession. But the Blackout Bowl speaks to an even greater sense of unease. When South Africa hosted the World Cup, the European Press was filled with denunciations of this choice, because surely “a developing nation” wouldn’t have the wherewithal to host an event of such status and magnitude. What does the thirty-four-minute blackout—caused by too much electricity—say about this country? Have we overdeveloped or are we actually undeveloping? Are we the player, so pumped up on steroids that we can barely squeeze out of their jerseys or are we the player so decimated by repeated blows to the head, we need help remembering the names of our family? We’re both: two Americas defined by structural inequality and the withering of the idea that this could be one indivisible country with collective, common interests. If there was one commercial in the swamp of Madison Avenue goop, that actually had an unintentional ring of truth, it was the ad for CBS’s sitcom 2 Broke Girls. The show is about two young waitresses, the whip-smart Kat Dennings and Beth Behrs, as they struggle through the Great Recession in Brooklyn. The ad had Dennings and Behr strip and pole-dance while the phrase 2 Broke Girls flashed in neon over their heads. This is neoliberal America in nutshell: a place where there are those who strip and those who watch; those who serve and those who get served. This is an unsustainable state of affairs. The problem with widening inequality is that like the blackout, it really doesn’t matter whether it happened because there was too much electricity or not enough. It results with everyone sitting in the dark with no solution in sight. Read Dave Zirin's take on the NFL and LGBT (in)equality.